The third edition, Two Scoops of Django: Best Practices For Django 1.8 is available! Revised and expanded to 532 pages, it's a whole new book full of new material. Please consider it before purchasing this edition! 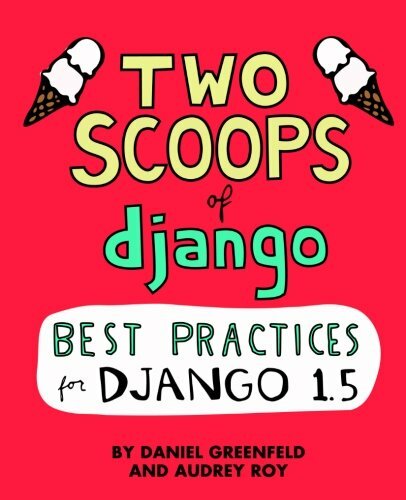 Two Scoops of Django: Best Practices For Django 1.5 is chock-full of material that will help you with your Django projects. We have put thousands of hours into writing and revising its 300+ pages of concise, example-packed text. “A single read-through of Two Scoops of Django gave me so many lightbulbs and tips; I had to go back for a second helping.” -- Lynn Root, Red Hat engineer and PyLadies ambassador. Ha ha, I learned something in the first chapter. Awesome. -- Zed Shaw, Author of Learn Python the Hard Way.